Despite an advertised July 15th launch, at the time of publication the HopRocket website only features a marketing video. An affiliate website is live over at “myhoprocket.com”, but fails to disclose who owns the company. It isn’t until one looks up domain registration info that who is behind HopRocket is revealed. Both the HopRocket and MyHopRocket website domains are registered to Fred Ninow of Ocean Avenue LLC, with an address in the US state of Utah also provided. Ocean Avenue was first launched back in 2012 by Ninow and Ken Dunn. The idea of walking away from MLM and OA is the toughest decision that I have ever had to make. Ocean Avenue is in great hands with Fred & Staci, Tuffy & Theresa and the field leaders. It is an amazing opportunity. I would recommend it to anyone asking. I just have another direction that I need to go in. One month later, Ocean Avenue merged with JM International to create JM Ocean Avenue. JM International, currently operating based in China and had expanded market to nearly 20 countries and regions around the world, is a hub for cutting-edge research and development and offers a wide range of healthcare related consumer products. June 5, 2014, Ocean Avenue and JM International, both multi-national direct sales companies, today announced a merger to create opportunities for distributors and customers by expanding to over 25 new markets around the world this year, offering a broader and deeper range of products and increasing sales. The venture, JM Ocean Avenue, is collaboration between two companies whose combined strengths will result in a global company able to produce and deliver innovative products through a superior and far-reaching global distributor network. The JM Ocean Avenue website lists Jacky Zhang as “Global CEO” of the company, presumably appointed at the time of the merger. Somewhat curiously, Fred Ninow (right) does not appear on JM Ocean Avenue’s listed Executive Team or Board of Directors. Infact Ninow’s name does not appear anywhere on the JM Ocean Avenue website, leaving his position within the company a complete mystery. With Ninow’s name popping up on the HopRocket domain registration, it’s probable that this might be a separate side venture of JM Ocean Avenue that he’s been put in charge of. Claiming to have partnered with an unspecified “world-renowned travel agency”, membership to the Ocean Avenue Vacation Club is available to Ocean Avenue customers who spend a minimum of $50 on product purchases. Details on the Vacation Club are sketchy, save that Ocean Avenue affiliates and customers will be able to book resort accommodation and cruises. Unfortunately pending full disclosure by HopRocket, the executive management structure of the company is currently unknown. HopRocket’s retail membership is $49.95 and then $19.95 a month. 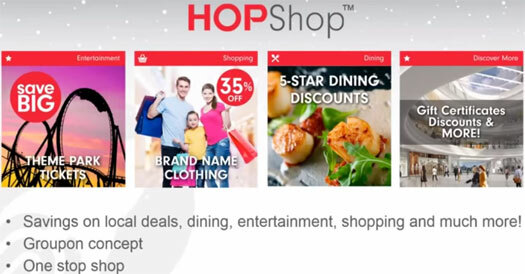 HopRocket claim HopShop provides access to “dining, sporting events, theme parks, appliances and name-brand clothing” discounts. The HopRocket compensation plan pays affiliates to sell travel to retail customers and other affiliates. HopRocket affiliates are also paid to acquire customers and recruit other HopRocket affiliates. There are eight affiliate ranks within the HopRocket compensation plan. Note that GV stands for “Group Volume” and is sales volume generated by an affiliate’s entire downline. GV includes the sale of travel, customer signups, affiliate recruitment and monthly retail customer and affiliate membership fees. Some components of the HopRocket compensation plan payout in Rocket Rewards. RocketRewards are dollar for dollar discounts that can be put towards purchases in the HopShop (see HopRocket product line section of this review). HotRocket affiliates are paid $20 for each retail customer (non-affiliate $49.95 a month membership) they sign up. Recruitment commissions in HopRocket are paid out via a unilevel compensation structure. If any level 1 affiliates recruit new affiliates, they are placed on level 2 of the original affiliates unilevel team. If any level 2 affiliates recruite new affiliates, they are placed on level 3 and so on and so forth down a theoretical infinite number of levels. If three affiliates are recruited within 30 days of joining HopRocket, a bonus $150 commission is paid out. If these first three affiliates go on to recruit three new affiliates too (within 60 days), a Go Pro Camera or $250 bonus is awarded. If second level affiliates (9) go on to recruit three new affiliates each (within 90 days), a $1000 vacation is awarded. If all of the above is completed within 35 days of a HopRocket affiliate signing up, a $2500 bonus is paid out ($1000 if done in 60 days). Finally, if a HotRocket affiliate recruits and maintains three monthly fee-paying affiliates, their own $59.95 monthly membership fee is waived. Every HopRocket affiliate receives 30 HopPasses when they sign up, and then 10 each month. When a HopRocket affiliate hands out HopPasses and they are used by retail customers to book travel, a $200 Rocket Rewards commission is paid out per HopPass used. A Rocket Rewards commission is paid out when retail HopRocket customers book travel, equating to the difference between the retail and wholesale price of the travel booked. Note that any HopPoints used towards travel discounts eats into any commissions paid out (at a rate of 1 HopPoint equal to $1). HopPoints can be put towards discounts within HopRewards, at a rate of 1 HopPoint being equal to $1. HopRocket’s Generation Bonus uses the same unilevel compensation structure used to pay out recruitment commissions. Generations are calculated in each individual unilevel leg, defined when a Team Leader or higher ranked affiliate is found. The Generation Bonus itself is paid out on the Team Leader’s entire downline’s monthly sales volume. The Global Bonus is made up of 2% of HopRocket’s unilevel sales volume (recruitment commissions). Affiliate membership with HopRocket is $299.95 and then $59.95 a month. If a HopRocket affiliate recruits and maintains three affiliates, the $59.95 a month fee is waived. Whereas pretty much every travel-based MLM opportunity focuses exclusively on recruitment, HopRocket offers up a decent enough effort at travel commissions. In paying out the difference between retail prices offered (available to HopPass trial members and $49.95 retail customers), HopRocket’s travel commissions work much the same as any other retail commission. What will be interesting to observe however is whether or not the retail prices offered are competitive. Given that there’s a wholesale price offered to affiliates, there’s obviously a markup at retail level. Markups (and therefore commissions) are notoriously razor-thin in the travel industry, so how far off the mark HopRocket’s retail travel prices are when compared to their wholesale offering will be interesting. Too high and retail activity within the opportunity will fail to materialize. Too low and affiliates won’t bother focusing on it, instead opting to focus solely on recruitment commissions. And that brings us to HopRocket’s red-flags. For reasons I’m not entirely sure of, HopRocket offer recruitment commissions down nine levels of recruitment. There’s no justification for this, with the commissions clearly paid out of the fee new affiliates pay when they sign up. This lends itself to chain-recruitment, with commissions also paid out on the ongoing monthly fees paid (through the unilevel). That an affiliate’s monthly fee is waived if they recruit three fee-paying affiliate’s doesn’t help, further incentivizing a focus on recruitment over retail. Ditto the Global Bonus, which redistributes a portion of company-wide affiliate fees to those with the biggest downlines. You sign up as a HopRocket affiliate for $299.95, recruit others who do the same and collect recruitment commissions down nine level of recruitment. I suppose the counter to this is the HopPass, which offers retail customers a $200 discount on booked travel. One thing I’m not clear on though is whether or not this discount eats into the retail commission offered on purchased travel. $200 is likely to drop the price to below wholesale, meaning there’s actually a negative margin against the wholesale price. HopRocket affiliates are paid the $200 HopRewards, but those can only be put towards discounts through HopShop. Details on HopShop are currently sketchy, but it appears to be an e-commerce portal HopRocket will fill with third-party products and services. There’s nothing wrong with that in and of itself, but if the offerings aren’t up to scratch then HopRewards are likely to be ignored – focusing affiliate attention back onto recruitment. I didn’t see anything in HopRocket marketing or presentations stating whether or not affiliates can use HopPasses. This left me questioning how effective handing out five HopPasses to $49.95 retail customers would be. If they do distribute the HopPasses they receive to additional retail customers though, then that could be a great way to drive genuine retail activity throughout the business ($49.95 retail customers only earn HopRewards). One final point I’ll address is the migration of JM Ocean Avenue affiliates into HopRocket. If you moved over from JM Ocean Avenue your position’s already there, you just use your old username and password. Your downline was moved over as a courtesy, everyone who was in JMOA was moved over here. As far as I know this isn’t disclosed to prospective HopRocket affiliates who aren’t in JM Ocean Avenue. How big the JM Ocean Avenue affiliate pool migrated into HopRocket is I have no idea, but pre-made downlines and team migrations from an existing opportunity isn’t exactly what I’d call an even field for newcomers. How successful is a new HopRocket affiliate who had nothing to do with JM Ocean Avenue going to fare against established teams that might number in the thousands? Before joining, make sure you check with your potential upline as to how much retail volume they generated over the prior three months. Take that figure and then compare it to what they earned in recruitment commissions. Also throw some vacation ideas at them and see what they come back with. Take those figures and compare them to what you can find elsewhere. That alone should give you a enough information to begin your assessment of HopRocket affiliate membership, while you gnaw over some of the bigger issues we’ve covered in this review. Update 3rd August 2015 – Following the resignation of four JM Ocean Avenue executives (including Fred Ninow), it’s been asserted that HopRocket has nothing to do with JM Ocean Avenue. This article is laughable!! Most of it is not even close to accurate!! Paddy I know who you are and i feel very sorry for you!! Sorry they wouldn’t even give you a contract at Jeunesse when you were trying to leave Nerium! Looks like Hop Rocket is already shaking things up in the industry and it hasn’t even launched yet. Sad to see big companies worry about the new kids on the block..
That in itself says allot… and for those inquiring minds JM Ocean Avenue has zero affiliation with Hop Rocket! Wishing you all Success!! and for those inquiring minds JM Ocean Avenue has zero affiliation with Hop Rocket! Wishing you all Success!! So HopRocket stole the JM Ocean affiliate database and created pre-loaded entries for all their affiliates without their permission? Are you interested in joining this exciting brand new JM OCean Avenue opportunity? Oz.. Anyone with a computer or a smart phone can write a blog or create a Facebook page, you know that. If you refer to your link on Facebook that is not a company page. That appears to be someone promoting in the UK. To answer your question no they did not steal the database, people in JM Ocean Avenue that wanted to join Hop Rocket could enroll anywhere they chose. JM Ocean Avenue is alive and doing well they are part of a the number 10 company in the world according to the DSN, and doing over 2 billion dollars in sales last year. Although being part of a 2 billion dollar company would be phenominal Hop Rocket is a different entity entirely. Oz thank you for the value you bring to the NWM communities I would be happy to share with you correct information about the company when we launch. We have set out to do things different here and build a very customer centric program with real value for the consumer. Even if they have no interest in being a “distributor” which we call “Member Elites”. True, but we’re not talking about “anyone”. We’re talking about a HopRocket affiliate publicly advertising the opportunity. That is not what was mentioned on the corporate HopRocket call I listened to. A gentlemen clearly stated that all JM Ocean Avenue affiliates had already been entered int the HopRocket affiliate database, and that they could just login using their same JM Ocean Avenue affiliate login details. Also Ninow and Ocean Avenue LTD appear on the HopRocket domain registration. Ocean Avenue merged with JM International and are now JM Ocean Avenue. Yet you continue to claim JM Ocean Avenue has nothing to do with HopRocket? Thanks for your reply just not really sure of the intent of this article. Was it to do a honest review on the company or make it look bad?? I guess bad press is more intriguing to the reader in todays world. All of the information you have acquired is not complete thus probably raised a few questions and I can understand that. (The company is not even open for paid enrollments yet) Including the details of ownership etc. The company plans to have all of that public before the pre-launch that is happening at the end of the month. I will be sure to update you here when it is all publicly available. Thank you again but please don’t try to tear down a company based off of incomplete information and assumptions that may have been presented to you. The world is going to see what Hop Rocket is all about very soon! John Freemont: Was it to do a honest review on the company or make it look bad?? That would depend on how you view the revelation that JMOA’s data has been already imported into HopRocket, doesn’t it? John Freemont: That in itself says allot… and for those inquiring minds JM Ocean Avenue has zero affiliation with Hop Rocket! oz: Also Ninow and Ocean Avenue LTD appear on the HopRocket domain registration. john freemont, you barged in here alleging oz did not have information. you said hoprocket has nothing to do with JM international, and when you got caught out, you resort to questioning the ‘intent’ of the article. please be specific, what exactly has been represented in the article above? are you sure You are Well Informed? the article above says ‘good luck’ at the end, which is pretty rare on behindmlm. hoprocket has not been ‘torn down’ as you allege, some red flags have been addressed. this is a review site, remember? FW: You and I have joined a NEW company! OK… that may be just a little misleading but it’s actually ALL true. The key Owners of JM Ocean Avenue have formed a NEW and TOTALLY separate Company (a Delaware Corp) called HopRocket. And you and I have actually already joined it. It’s a Brand NEW Travel Club Membership Company like you have never seen. You will get discounted deals on TRAVEL that you simply won’t believe is even possible. Imagine… You can now get paid to go on vacation throughout the year! Backed by Billions of dollars and partnered with a 25 year old Travel Membership Company (with over 600,000 members) exploregci.com, what we are about to launch will be unlike anything out there in the Travel Industry today (or that has ever been). Please know… I got my start in this industry 18 years ago in a Travel Company called TravelMax, and owned my own Travel Company at one time and I can assure you what they are about to pre-launch this week is going to be very big. All they/you need to do is to go to the site, log in and accept the terms and conditions. Then… on July 15th, the Official Launch of HopRocket, after being able to see how all of this works, everyone who wishes to, can PAY for their position and collect the commissions of everyone else who paid below them (or will pay once they hear about this). In the mean-time… we’ll be able to enroll people for free right up until July 15th when the HopRocket Booking Engine goes LIVE. I want my personally enrolled leaders who want to really build this on top. So make sure you’re on my call on Monday and I can explain what’s happening and what I’m going to do in moving forward. This CAN affect you right out of the gate. Several people on my team will earn the $7,500 Bonus on July 15th when we launch. I’m going to tell you how easy that will be on Monday. (Especially with my help). Uh, what about the permission of the affiliates? And shouldn’t JMOA have deleted the personal details of affiliates who left “a long time ago”? Surely there’s privacy issues with creating affiliate accounts with ex-affiliate details without their consent and then spamming them with HopRocket??? As for Global Connections, historically recruitment commissions + access to third-party travel discounts has resulted in an recruitment-orientated opportunity. I don’t see HopRocket turning out any different. John Freemont: JM Ocean Avenue is alive and doing well they are part of a the number 10 company in the world according to the DSN, and doing over 2 billion dollars in sales last year. Anonymous: The ENTIRE downline of JM Ocean Avenue was moved over into HopRocket (with the permission of JMOA) with ALL of our downline intact. guys, i hope you notice that your stories dont match up. if JMOA is doing crackling business why will they give permission for the entire downline to be exported to hoprocket? this seems more like JMOA crashed, and now the key owners have registered a new company to continue the recruitment game. it’s like a reboot of JMOA rather than a new company. I really don’t understand why under the voice ” about us ” in the main web site of HopRocket company, there is written anything about the ceo. And Someone told me that the ceo is Tim Richerson a famous milionaire….but who is he ? Can you tell me your opinion OZ ? Thanks. What’s there to have an opinion about? The owner(s)/management of HopRocket don’t want to be associated with the opportunity, and that should set off your alarm bells from the getgo. David Hull, the guy who announced the JMOA database was taken (hijacked) into the HopRocket system up above has disappeared as far as any connection with JMOA or Hoprocket including his Facebook and LinkedIn accounts. Does he know something? Usually this behavior is associated with inside knowledge bad news is on the horizon. I just started doing my research on this HopRocket opportunity after some irritating information concerning ProTravelPlus and the leadership becoming MIA! It has been mentioned that certain leaders from PTP are now spearheading HopRocket, 2 in particular. Do the names Seth Fraser and Charles Vest ring a bell? Fraser has already moved on? He’s getting quicker and quicker that one. Wow the assumptions going on in this thread are a joke! Joy Maine merged with ocean avenue and the company name changed to JM ocean avenue – joy Maine is $2 b company coveting the east / they hoped the merger would give them some growth in the west but the management could not work together so after much negotiation the ocean avenue management team left JMOA and formed hop rocket – which was going to be a subsidiary of JMOA but at the last minute that broke down. The ‘network’ you refer to that was transferred to HR was NOT the JMOA global network just the smaller USA and euro team who were in the old ocean avenue data base. Many of the JMOA people did not join HR so their growth is now coming from new people and a lot of your info about HR is already out of date. $2 billion dollar companies don’t merge with failing companies and change their name. Joy Maine was an MLM opportunity nobody had heard of. They merged with Ocean Avenue because both opportunities were on the rocks. Sugar-coat it all you want, that’s pretty much all that happened. Yet you didn’t point out anything specifically. Look, if HopRocket are paying affiliates to recruit new affiliates, it’s a chain-recruitment scheme. Historically the MLM travel niche has a huge problem with generating retail sales, so any opportunity that doesn’t go gang-busters with a retail focus is going to follow suit. so what is this hop rocket thing?? kindly explain more about this travel agent and if it is registered… because so many people are joining and few of us need too know more before joining the chain or tree..
How many people joining are affiliates, how many are retail customers? How many retail customers does the person trying to recruit you have? Did they approach you first with the product or the business opportunity? Those are the questions you want answers to. Fred Ninow is currently in Papua New Guinea promoting hop rocket. One of my friends joined in April. Currently she is working on her level three. When should she start receiving her benefits as promised. Uses third party affiliates no agency – offer no real savings or value and not legitimate seller of travel – most likely not set up legal in AU. My personal thoughts: how serious can it be with a name like HopRocket? Lol.